"Has excellent soundproofing and abundant cycle options." ﻿“A great washing machine for apartment dwellers lacking a washer hook-up." Front loading washing machines are a popular choice when shopping for a new washing machine thanks to their water savings capabilities. One of the best buys is the Samsung AddWash Front Load Washer, which combines the best features of front-loading washing machines with an innovative design. Most noticeable about the Samsung AddWash Front Load Washer is the smaller inset door that lets you add forgotten items to the wash without restarting the entire cycle. Many people complain that front loaders are inconvenient when you find a lost sock or one more bath towel that needs to be added to the wash since you’ll have to abort the cycle and wait for the water to drain. This isn’t an issue with the Samsung AddWash thanks to the easy access door. 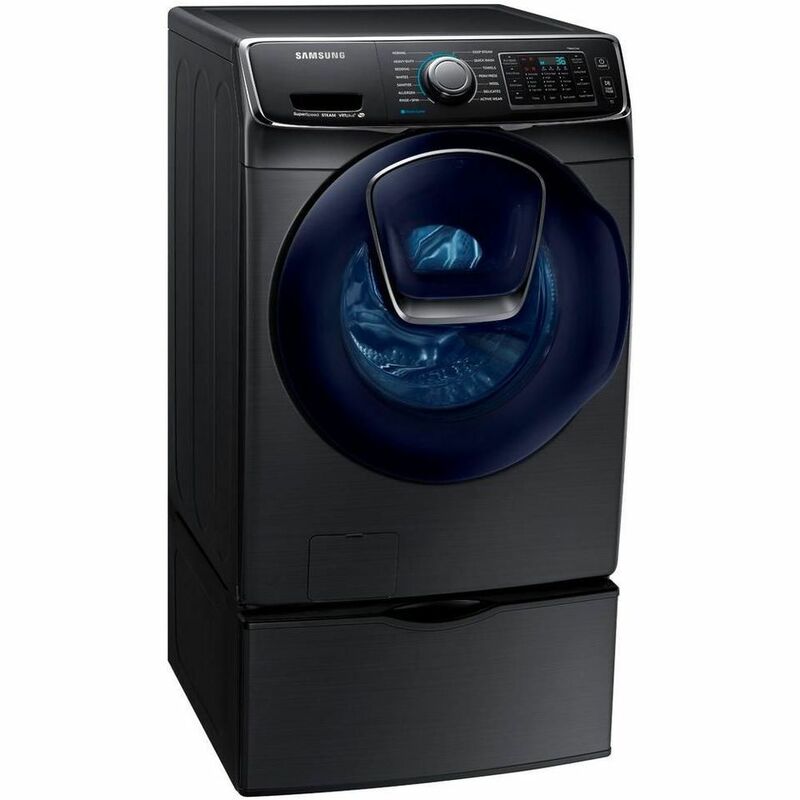 When it comes to washing abilities, this popular model from Samsung features 14 preset wash cycles plus a control pad with options to modify water temperature, soil level, and spin selection. The Samsung AddWash Front Load Washer has been described by users as the “washer from the future” for its excellent soundproofing, abundant cycle options, and eye-catching design. Just know that this is a very heavy machine and some people said it can also be tough to get items from the back of the drum if it’s not set up on a pedestal (sold separately). You can also purchase the corresponding clothes dryer to complete the set. Both are Energy Star Certified. For other sets that you can buy together (you'll save more money this way), check out our favorite washer and dryer sets available online. If you’re looking for a top loading washing machine that tops all others, consider the Whirlpool High-Efficiency Washer. This top-load washer features 4.3 cubic feet of drum space and enough options to meet your laundry needs without complicating the straight-forward design. Peek under the lid of this machine and you’ll see that this front load washer features an impeller instead of an agitator. While many users said they were hesitant to abandon the agitator, they have been very happy with the impeller’s efficiency and performance, as long as you follow the instructions and load the machine properly. One of the things we love most about this top loading washing machine is the Quick Wash cycle—throw in a small load and it’s ready to be dried in under 30 minutes. This is perfect for last-minute laundry needs or zipping through a few small loads in a short amount of time. Otherwise, the average cycle time is around 45 minutes. Choose from eight standard cycles, plus Soak, Rinse & Spin, and Drain & Spin options. In addition, you can also opt for one of five different water temperatures. While this model receives a lot of praise for its washing abilities and reliability, one of the biggest complaints is that it omits a dispenser for bleach or fabric softener. If you typically use these products in your laundry routine, you can pause the cycle to add them at the appropriate time. Or, many people just use an in-wash fabric softener to avoid this hassle. Either way, this small hinderance isn’t enough to take away from the superstar reputation earned by this top loading washing machine from Whirlpool. An affordable favorite, the Amana 3.5 Cu. Ft. Top Load Washer is an easy pick if you’re shopping for a basic washing machine that offers top-notch performance. This frills-free top loading washing machine doesn’t give you an abundance of options or fancy design features, but it cleans well and operates reliably. There are four cycles to choose from, with a bonus option to choose between Normal-Regular and Normal-Heavy. There are also four water temperature settings, and the ability to use the machine’s auto-sensing feature for water fill—or override it with a deep water wash. Inside the machine, you’ll see an agitator and smooth porcelain tub. Top loading washing machines with an impeller have become popular, but many people that purchased this budget top loading washer were happy to see the familiar agitator inside and found that its dual-action mechanism helps to get clothes clean. If you want a reliable top loading washing machine and don’t need specialty cycles—like steam or sanitization—then the Amana NTW4516FW is a great, budget-friendly option. Turn (almost) any room into a laundry room with a portable washing machine. This highly functional model from GE is our go-to choice for a compact washer you can wheel anywhere. While a portable washing machine might sound too small to be practical, this GE model can handle more than you what you might expect. With 2.8 cubic feet of space in the drum, there’s room for a full load—just not what you would expect to cram into a full-size washing machine. It’s a great washing machine for apartment dwellers lacking a washer hook-up, for an RV, or for an auxiliary washing machine when you want a smaller unit to do in-between loads. This surprisingly full-featured washing machine has a digital touch display where you can select one of eight wash cycles and four water temperatures, plus options like Deep Fill, Deep Rinse, or Delay Wash. The stainless steel basket won’t snag clothes and the impeller plate gives more room for your laundry while still delivering a thorough clean. The hinged lid is also a popular feature for people; it folds in half and stays back until you’re done loading or unloading. Four locking caster wheels make it easy to wheel the washer over to the sink when it’s laundry time. The washing machine includes an adaptor, but note that if you have a non-standard faucet, it may be tougher to make it work out of the box. One user mentioned needing an adaptor for the adaptor in order to properly connect the washing machine to the faucet. Most people that have tried this portable washer would recommend it to a friend. It's much pricier than other portable washing machines, but it’s also much more capable. Other models are made from plastic pieces and have limited capacity—often as little as 1-1.5 cubic feet of space inside. The GE Portable Washer is one of the only models we’ve seen that can actually stand-in for a traditional washing machine and has many of the same cycles and features of full-size machines. Take a peek at some of the other best portable washing machines that are available. The GE 4.9 Cu. Ft. High-Efficiency White Top Load Washing Machine is a smart washing machine that cleans efficiently and comes with smart features. It's a beautifully designed and practical appliance to complement your smart home. This top load washing machine from GE is equipped with Wi-Fi to connect to your devices along with popular smart home hubs like Amazon Alexa and Google Home. This means that you can check in on the status of your laundry and control certain aspects of the smart washer’s operation via the proprietary app. Additionally, the GE Top Load Washing Machine with Wi-Fi includes an auto-dispenser for laundry detergent and will add the right amount to each load based on the cycle and load size. People that have used this smart washer say that it’s “a rugged machine, not delicate or sensitive [like] some “advanced technology” machines…[it] performs unattended and cleans well.” That’s our idea of an intelligent washing machine! It’s also rated for efficiency by Energy Star. The only common complaint is that the washer drum is just deep enough to pose a challenge when unloading wet laundry—some people have to use a step-stool to reach the bottom. If you feel like you're constantly doing loads of laundry, then investing in a large capacity washing machine is the quickest path toward empty hampers and clean clothes. The Maytag MVWB965HC offers 6.0 cubic feet of interior space to load up everything from jeans and jackets to sheets and blankets. Cavernous and monstrous are two words often used to describe this machine, but don’t let that scare you away. This large capacity washing machine is also Energy Star compliant and features auto-sensing technology to avoid wasting water. If you need to wash a small load, this machine can comply. But of course, if you’re shopping for a large capacity washing machine, you’ll really appreciate the fact that this top loader is nearly the biggest washer on the market—even beating out front loaders. Unlike many other new top loading washing machines, the Maytag MVWB965HC features a center agitator, which a lot of users prefer over an impeller plate. Despite the space taken up by the agitator, the machine’s 6.0 cubic feet of space is plenty to wash things like two comforters, eight or more pairs of jeans, and towels for a whole family. A PowerWash feature ensures that soapy water is pumped up to the top of the wash basket and delivers a thorough clean to items at the top of the load. If you want the best of the best, this high-end washing machine comes with dozens of great features, as well as a huge capacity for even the biggest loads. The LG Signature Front Load Washer has a sleek, polished appearance, and its 5.8-cubic-foot capacity is ideal for large, busy households. No more taking trips to the dry cleaner when you need comforters washed—this LG washing machine can accommodate even a king-size blanket. There are ample wash settings, from normal and heavy duty to delicates, sportswear, speed wash, and more. The washer uses TurboWash technology, including high-pressure nozzles, to get big loads clean in less time, and it also boasts steam technology to help you remove wrinkles and odors from clothes. The LG Signature is also compatible with SmartThinQ, which allows you to monitor its progress remotely via your smartphone. If you want a washing machine that can handle any load and comes with lots of bells and whistles, this washer deserves a second look. If you want to take a look at other models that can save you money, see our list of the best high-efficiency washers available online. Save space without compromising on functionality with a stackable washing machine and matching dryer. One of Maytag’s newest stackable washers is the Maytag 10-Cycle HE Front Loading Stackable Washer. This roomy yet stackable washer will take on loads both large and small while delivering big cleaning power, thanks to an ‘Extra Power’ function available on every cycle. Open the door to this high-efficiency washer and you’ll see a stainless steel wash basket with 4.5 cubic feet of space. There’s plenty of room in there for thick towels, and a week’s worth of school uniforms, gym clothes, and active wear. The cycles are relatively standard but do include bonus options not commonly seen—like Whites and Wrinkle Control. As mentioned, you can give any cycle a boost of cleaning power by pressing the ‘Extra Power’ button. Users report that this stackable washing machine delivers clean clothes every time, though a few people felt the wash cycles were long. This isn’t uncommon for front load washing machines but can pose a challenge if you’re in a hurry or have a lot of laundry to do. Fortunately, the large size of this stackable washer compared to more compact models means that you can do fewer, larger loads. Still can't decide on what you want? Our round-up of the best stackable washers and dryers can help you find what you're looking for. The LG WM3488HW features nine wash cycles, including specialized options for hand wash items, baby clothing, and sportswear. You can also download specialty cycles using the LG app for smart appliances. The dryer function is also well-equipped with seven cycles that pair with the washer settings. You can opt to wash and then dry a load automatically or set the machine to wash or dry only. People that have tried this LG All-in-One Washer and Dryer love the space-saving design and the fact that you don’t have to switch laundry from the washer into the dryer. While this style of washing machine sometimes gets a bad rap for taking a long time, people say that most loads are washed and dried in about two hours. After the dry cycle has completed, clothes might initially feel damp, but give them about 30 seconds to evaporate any remaining steam and they should be ready for folding. This LG washing machine is a good choice for a few people, but it may not be able to keep pace with a large family. However, if you try it, you might be surprised how much you like the convenience of having an all-in-one washer and dryer that also saves space. In fact, it has made many people say they’ll never switch back to a conventional washer and dryer since this machine offers big improvements in ventless dryer technology.